NEW YORK, June 22, 2015 – Professional installers, renters and homeowners agree: when it comes to bath and shower renovations, they could do without the heavy construction. Enter the smart solution, GROHE’s Retro-Fit™ Shower System, which transforms an existing shower head installation with concealed pressure balance valve into a luxurious shower system without breaking the wall, all in under an hour. Launching this month, the new offerings are sure to be met with the same success. “There is such a demand for beautiful fixtures that are easy to install. By expanding the Retro-Fit collection, we are offering even more ways to customize and transform people’s shower experience,” says Cheryl Dixon, Head of Brand Trade and Marketing for GROHE, the world’s leading single-brand manufacturer and supplier of kitchen and bath fittings. Below, Dixon outlines each new model. Featured above, GROHE's first new model in the new Retro-Fit Shower System with standard shower arm and New Tempesta Cosmopolitan 100 shower head and hand shower in the GROHE Starlight® Chrome finish. Compatible with shower/tub combinations. 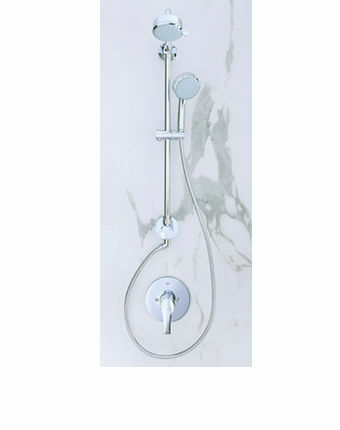 A new 25-inch rail model with a standard shower arm is offered with New Tempesta Cosmopolitan shower heads and hand showers. Compatible with shower and tub combinations, this system is available in the GROHE Starlight® Chrome finish. “New Tempesta Cosmopolitan provides users with multiple spray setting choices for an invigorating shower experience,” notes Dixon. 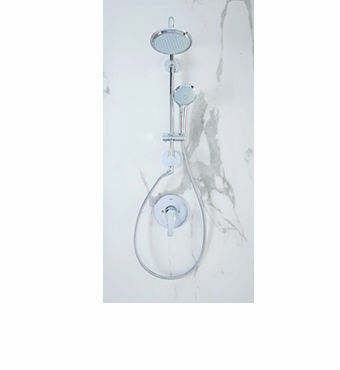 New Tempesta Cosmopolitan is also now offered with a new 18-inch shower only application, complete with a standard shower arm. “This new model was designed with a shorter rail to meet the needs of consumers who may have a free-standing shower area,” Dixon advises. The version is also available in the GROHE Starlight® Chrome finish. 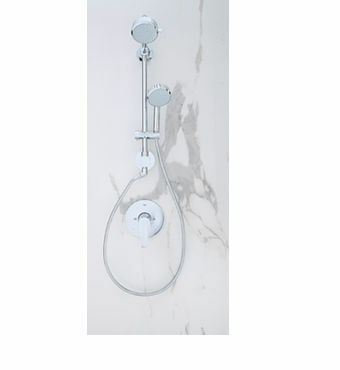 A second 18-inch shower only model, this one with a Rainshower arm, rounds out the newly expanded options. This model is coupled with Euphoria® shower head and hand shower, which offer a wider spray, and is available in GROHE Starlight® Chrome finish. Featured above, GROHE's second new model in the new Retro-Fit Shower System with 18 inch shower arm and New Tempesta Cosmopolitan 100 shower head and hand shower in the GROHE Starlight® Chrome finish. Compatible with shower only installations. Featured above, GROHE's third new model in the new Retro-Fit Shower System with 18 inch shower arm and Euphoria® shower head and hand shower in the GROHE Starlight® Chrome finish. Compatible with shower only installations. GROHE EcoJoy™ technology reduces water consumption by up to 50 percent without compromising performance, and comes standard with Retro-Fit. All models also come complete with other GROHE technologies, such as GROHE DreamSpray®, which distributes water evenly to all nozzles on the shower head and GROHE SpeedClean® anti-lime system. Installers and consumers agree that the quick and easy installation process, which produces a stunning end result, is one of the key benefits of the Retro-Fit Shower System. “With customized renovations in the shower area continuing to trend, we lead the category by producing efficient, stylish solutions like Retro-Fit,” Dixon notes.